Cable news has thoroughly enjoyed painting the 2016 general election as being between the two least liked candidates in modern history. That’s a work of historical fiction which ignores that neither George Bush or Michael Dukakis was particularly popular toward the end of the 1988 election cycle, and that George W. Bush and Al Gore didn’t break any records for popularity in 2000. But there is a partial truth behind their claim about 2016, which is that Hillary Clinton’s dominant poll numbers aren’t backed up by a strong favorable rating. There’s a reason for that, and it’s not the one the media is promoting. In fairness to cable news, they are getting half the equation right. Donald Trump has a 34.6 percent favorable rating across an average of current major polls, making him one of the most broadly disliked presidential nominees in the history of polling. But even though Hillary holds a dominant lead in the polls, her own favorable rating is just 42.1 percent. That’s nearly eight points higher than Trump, meaning that the “both candidates are equally unpopular” claim is a flat out lie. But still, Hillary’s surprisingly low favorable number has given the media license to paint them both as being disliked. Here’s the problem with that. You might instinctively think that when one of the final two candidates is that hated, it should give a boost to the other candidate’s reputation. But undecided and politically apathetic voters don’t think in those terms. They view both parties as somehow being equally responsible for the state of the nation. They view the two candidates as jointly being a referendum on the current quality of politicians. And when they view one candidate as being absolutely horrible, it drags down their view of the entire election such that they end up partially blaming the other candidate for it. That makes no logical sense to anyone who has even a basic understanding of how politics works and what elections are. But the average voter does indeed have rather little understanding of the subject matter. Imagine watching a football game with someone who is irrevocably convinced that both teams are somehow one big team, and thus views the “quarterback play” for the game as being mediocre despite one of them throwing three touchdowns and the other throwing three interceptions. So if you want to understand why Hillary Clinton’s favorable rating isn’t as high as it seemingly should be, it’s because she’s being partially blamed for the total lack of quality opponents who have surrounded her on all sides. Aside from Hillary, the slate of Democratic candidates in 2016 was pathetic, and the slate of Republican candidates was even worse. The reality is that her top potential opponents in both parties didn’t want to bother running in 2016 just to lose to her, so they stayed away from the race. That created a vacuum such that her main challenger in the Democratic primary wasn’t even a registered Democrat, and her Republican challenger in the general election is a reality show host who beat out the most hated senator in the nation and a mentally unstable doctor. And so the irony is that Hillary’s overwhelming popularity at the start of the 2016 election was the reason she ended up with so few quality opponents, and her lack of quality opponents is why low-information voters have ultimately taken it out on her favorability rating. Not that it matters. Elections are decided based on who you vote for, not on who you like. And when it comes to those polls, Hillary holds a seven point lead. That may not sound like a blowout. But in the entire history of presidential polling, every time a candidate has gone into September with a lead this large against a non-incumbent, they’ve won. Once Hillary Clinton gets into office, assuming she wins, she’ll cease being judged on the quality of her opponents, and she’ll begin being judged on her own inherent popularity and performance. 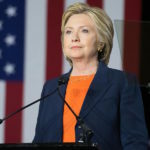 Considering that she had an approval rating of nearly seventy percent by the end of her time as Secretary of State, her current numbers should improve drastically after the election. For now it’s merely the price she pays for having run against such an unpopular field to begin with, and for facing such a deeply unpopular final opponent. It’s yet another reminder that undecided voters don’t really understand what an election is.